Under the pier is one of Sidney’s Nolan’s most well-known paintings from the St Kilda series which he began in 1941, during the early stages of his artistic career. Nolan grew up in St Kilda, a bayside suburb of Melbourne which, during the early 1900s, became a popular recreational area, replete with a Luna Park, theatres, beaches and public gardens. During the Great Depression and the Second World War, St Kilda became increasingly run-down and, attracted by cheap housing, European migrants and artists including Sidney Nolan, Albert Tucker and Joy Hester, lived and painted there. Nolan regularly returned to St Kilda and during the 1940s he created several paintings of Luna Park and bathers at the St Kilda pier and sea baths. There is a strong autobiographical element underpinning Nolan’s St Kilda series. This is exemplified in Under the pier in which Nolan reflects on his experiences growing up in St Kilda. 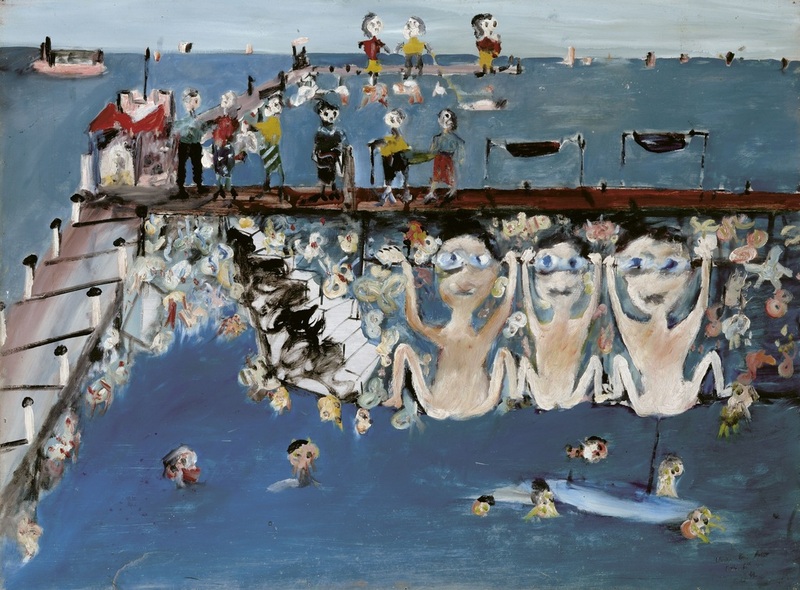 In this painting, Nolan represents himself as one of three wide-eyed naked children, surrounded by a throng of smaller half-submerged figures swimming and hanging from the pier. The artist says of this work: ‘Boys aged 8 years – one on the right is Nolan, the other are the Brookes brothers “Brookies”. They mended fish nets after school – life was simple’ (Haynes, 2012). This painting expresses the youthful exuberance and the sense of joy and freedom of a Melbourne summer on the Bay.